The Empty Stadium: Has the NBA co-opted remix culture? If you have caught any NBA basketball games on TV recently, you may have noticed a slew of new commercials for the league that play on the NBA slogan: "Where Amazing Happens." The commercials are remixed video/audio clips that have been compiled by YouTube sensation DJ Steve Porter, most known for his video/audio remix of Allen Iverson's "Practice?" Press Conference (almost 2.5 million views). In the case of the NBA ads, Porter takes clips from games and auto-tunes coach and player audio snippets to amend the slogan into "Where Sixth Man/Determination/Defense/Clutch Happens." I've included the "Sixth Man" one below. One of the reasons that these advertisements struck me is because they are officially sanctioned commercial ventures, something that goes against the precepts of remix culture as chronicled by Shiga (2007). Typically, remix culture is an online phenomenon - produced by an amateur - that acts as a subversive departure from the "mainstream." Take, for instance, the Grey Album, an incredibly successful mash-up of the Beatles and Jay-Z by DJ Dangermouse. Released online only in 2004, Dangermouse created an un-authorized masterpiece that eventually exploded into the cultural mainstream. But it started online and, as a result of the album's success, Dangermouse has become one of the top producers in the music community (Gnarls Barkley, The Broken Bells; producer for Gorillaz, Beck, The Rapture, The Black Keys, and more). These NBA advertisements are working in reverse to traditional remix culture. Instead of originating organically, as DJ Steve Porter's "Iverson Practice" mash-up did, these are commercial endeavors - NBA is the patron and Porter is the creator serving that interest. In that they are commercial, they are also completely authorized by the NBA - a stark contrast to traditional principles remix culture. Furthermore, because they are authorized, they are absolute in their support of the NBA. Whereas the Iverson video undercut the NBA star by poking fun at the ridiculousness of his statement, these NBA advertisements are designed to paint a picture of the NBA that you want to see. The Izod Center in the Meadowlands can be a lonely place. So, beyond the consequences of attempting to co-opt remix culture, what does the - both absolute and authoritative - picture NBA and Porter create together leave out? 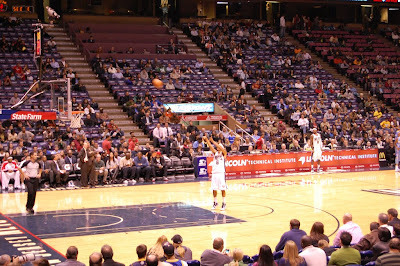 Half-empty arenas like the ones that the New Jersey Nets play in? Teams selling off their entire rosters to hope to land one of this summer's premium free agents? Refereeing scandals? Bored teams? Franchises moving from city to city? True remix culture may not unearth all of these problems - I mean, all Porter's "Iverson" video did was highlight the absurdity of a few individuals and the interaction between the media and sports - but it doesn't paint a beautiful gloss like the NBA's new advertisements do, either.